December is fast approaching and while it’s still a little ways away it’s a great time to think about personalised christmas card printing. Why bother adding extra stress to a stressful time by waiting? Why run out at the last second and buy some cheap generic cards when you can plan ahead and get great quality greeting cards printed? Most people assume that having custom print is exorbitantly expensive but the truth is it’s very affordable with the price of each card plummeting if you buy in any kind of bulk. That’s not to say we can’t provide smaller quantities. We can print short runs of personalised greetings cards, or even a single card, they just aren’t quite as cheap as they are when you buy more. Pricing aside the real benefit of getting your own personalised Christmas cards printed is that they’re personalised. It sound simple but it’s the truth, it shows your customers, colleagues, or employees that you care by going that extra mile. How we design your cards is also entirely up to you, if you want a generic nice design but with the company name or logo we can do that. Do you want an image of your business or employees? Easily done. Custom text? Not a problem! It’s especially good if you’re giving these to customers as we can add your company information to to back or wherever else you like. They could even be used as a subtle marketing tool if you want to use an image or two that highlight certain services you provide. You may thinking getting personalised christmas cards printed is a difficult or taxing process but that couldn’t be further from the truth. If you have a design ready to print that meets our print ready guidelines we can go ahead and print that right away. If you need us to make a design that’s also no problem. Just give our experienced design team as much or as little information as you like and they’ll whip up a design for you in no time at all. We’ll then send you a proof and let you make changes until you’re happy with the design and ready to let us print the cards. 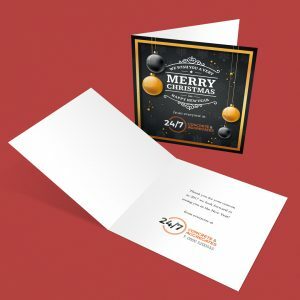 To find out more about our custom christmas card printing, or to place an order, call us today on 01924 261 154.